If an accident occurs which you think is covered by the insurance policy you have taken – for example, if there is damage to your workplace or factory by a fire or electrical problems or if there is a loss by burglary, you must inform the insurance company immediately (apart from notifying the Police etc). Do not repair the damage caused by the accident without getting the approval of the insurer. It is a condition in your policy that you will inform the insurer and get his approval. If you do not abide by conditions set out in your policy, the insurer can eject liability. Many people do not read their insurance policies. Having obtained his PhD from the London School of Economics, Dr Wicrema Weerasooria is an Attorney-At-Law, Supreme Court of Sri Lanka and Barrister and Solicitor, Supreme Court of Victoria, Australia. 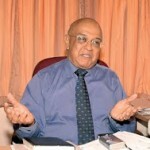 He is also distinguished former Public Administrator, Lawyer, Academic, Diplomat and Financial Consultant and has been holding office as the first Insurance Ombudsman of Sri Lanka since 2005.